Rose and Preston met 4 years ago at the gym. A year after dating he proposed and they planned a traditional local wedding. As the planning continued Rose, became overwhelmed with it all, canceled everything a couple months before the ceremony, and broke things off with Preston. After some time apart they were able to renew their relationship after Rose sent him a picture of an award for her fitness company, an award that Preston had helped her to achieve. After a year, Preston re-proposed. Rose figured out that what she really wanted was a small and intimate ceremony, and even better, a destination wedding that could also be a vacation with her closest loved ones. After the resort was booked the planning couldn’t have been a smoother process. Rose said the resort was so accommodating and great, and that the wedding planner was very attentive. The property proved to be wonderful, with a great beach and access to many activities on-site and nearby. The wedding ceremony also couldn’t have been easier or stress-free. Rose was so happy with how perfect and simple everything turned out. When she saw her husband with the ocean behind him it was amazing. 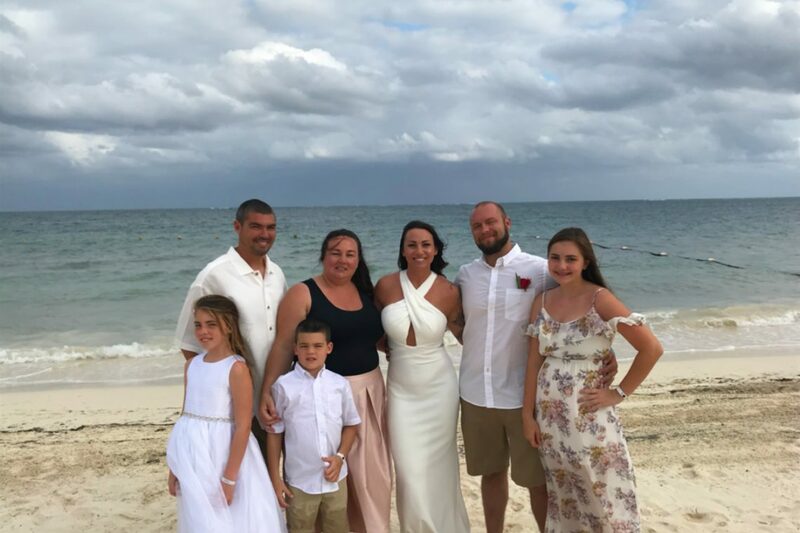 Rose said, “I literally just had to get in my dress.” The resort handled everything else, including instructing the young ring bearer and flower girl how to walk down the aisle. Rose and Preston hosted a semi-private dinner afterward at one of the resort’s restaurants. It included a delicious cake and photography included with their package. They did so much more over the week too. The couple and their guests went snorkeling, ziplined, ATV-ing, visited Mayan ruins, and even went cave swimming. Looking back Rose reflects on her wedding date. She originally wanted her ceremony on New Year’s day but that’s a very hard date to snag for Mexico, as there aren’t many (if any) resorts that will accommodate the holiday for ceremonies. She loved her wedding on the following day. Her advice is to just go for it! I would definitely say do it, getting married on the beach is just breathtaking!